I can honestly say that I’ve never experienced a week like this. And I cut my political teeth in 1974 watching the Watergate hearings. A remarkable speech, disputes over crowd size, arguments with Mexico, rogue twitter accounts, an inflammatory official twitter account, trial balloons that fizzle, executive orders that suddenly change the face of US policy, removing ACA signup ads, millions of alleged fraudulent votes, and an immigration ban. Several of my friends have been struggling to figure out how Christians should respond to this onslaught of events. What is the meaning of Romans 13? What is the nature of our political theology? Too often, their FaceBook commenters ask “what were you doing when Obama was president?” — which is remarkably selective memory but I’ll let that go. 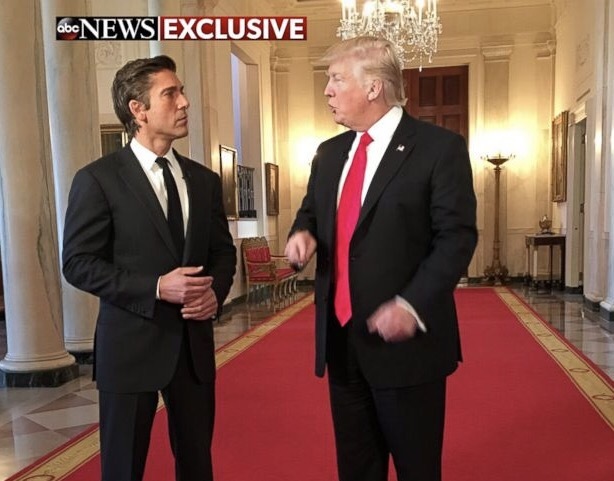 But there was a piece of Trump’s interview with David Muir on ABC that has been stuck in my brain. They were discussing the controversy over the crowd size at the inauguration. I could spent time disputing the “biggest audience” claim. I could rebut the claims on the positive polling on the speech. The poll Trump mentions is a Politico/Morning Consult poll and Politico reports: “Trump got relatively high marks on his Friday address, with 49 percent of those who watched or heard about the speech saying it was excellent or good, and just 39 percent rating it as only fair or poor.” Frankly, in comparison to previous inaugurals, those are horrible numbers. What really got my attention is what I highlighted above. Trump has proclaimed himself president of the people who were forgotten yet came out and voted for him, who traveled from their small towns to Washington to be there for this historic event, who filled the venues were he campaigned. This is not me. To not privilege their perspective is to demean them and he won’t stand for that (and I guess the ratings are supposed to reflect that). But he has no problem demeaning my positions. Take the outrageous claims about up to three million fraudulent votes, none of which could possibly have voted for him but all must have voted for Clinton. Besides the fact that other than inaccurate voter registration rolls (which is what the oft-cited Pew study was about), there is no evidence of voter impersonation (Trump commented on “dead people are registered to vote and voting, which they do” — which Trevor Noah called the worst episode of Walking Dead ever). Trump also misrepresents comments made by Obama in 2008 about election fraud (and he cites it as being in Chicago when it was in Kent, Ohio). Trump started the inaugural speech by calling out the Washington Establishment. But his later comments make clear that there is only one kind of forgotten American — those that voted for him and his “tremendous movement”. The questions about dual registration prompted me to do what Bannon and Spicer couldn’t be troubled to do — check my past registrations. I learned that I’m no longer registered to vote in either California or Oregon. But I’m a doctorally trained sociologist who tends to vote Democratic. In Trump’s eyes, I’m not forgotten, I’m establishment. I’m a white evangelical male who votes Democratic (which the media and politicians alike ignore). But whenever Trump repeats his concern for the Forgotten, whenever he advances the personal policies he advocated (which he does because he feels he promised them he would), when he demeans the press, when he gags federal agencies, he has said that people like me and my approach to civic life don’t matter. He is going to be the President of “His People” and I’m not part of the equation. He’s told me that He’s Not My President, he’s Theirs. And I’m just expected to just go along for the ride because my side lost. He’s #NotMyPresident and he is a #DelusionalPresident not much else can be said. Thanks John for your clear articulation of the situation. In a meeting today some were even considering the re-definition of “evangelical” but we must hold on. The “good news” have not changed.